Home animations and clipart images. Visit our buttons and animated buttons sections for more home clipart. Home icons with chrome frame - PNG with transparent background. 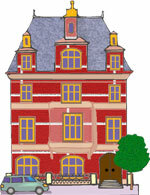 Home image blue with transparent background. We noticed many people visiting this page looking for houses so we thought we would add a few. 2 story home with brick chimneys. Round home made from nature. Wood house perhaps near the beach. If you use our home gifs please give us credit for our images.